There are many activities and opportunities open to you, some which are not available to you anywhere else! Below is a brief description of a few of these activities. Cadets can learn some very valuable, practical basics of first aid, for example how to deal with minor medical problems in serious situations, until the correct and fully trained medical help arrive. Map reading skills and expedition experience can be used in many situations and is an integral part of the Air Cadet’s outdoor activities. Skills such as reading grid references and taking a back bearing with a compass are taught as well as getting to the destination efficiently and safely. Our squadron has a fully equipped marching band that attends events, parades and ceremonies regularly throught the year. With a bass, tenor, snare drums and bugles the skills needed are taught at the squadron and no musical experience is necessary. Within our squadron we have the ability to use HF and VHF radio equipment. We also have the capability to learn and use other means of communication, such as Satellite Communications and Radio Direction and finding. The ATC offers cadets the opportunity to use the No.8, 0.22 calibre rifle and the General Purpose L98 with all shooting practices under strict supervision by military trained personnel. You can enter into shooting competitions and cadets can gain the experience to achieve marksman badges at different levels of competition. 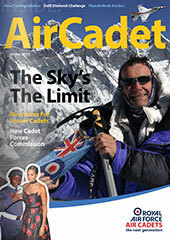 The Air Cadet organisation takes part in the D of E awards scheme at all levels of ability; Bronze, Silver and Gold. Cadets obtain each award by preparing for and taking part in many of the activities within the scheme.